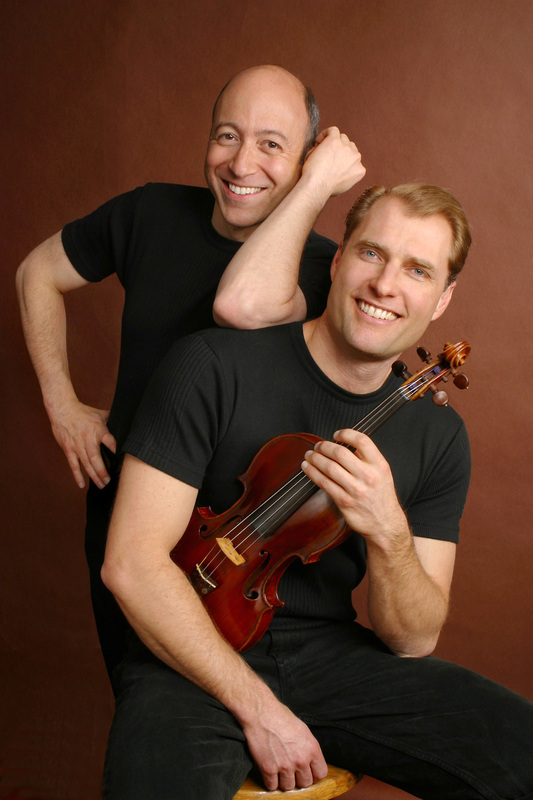 Champions of American music for more than a decade, Opus Two violin-piano duo, made up of violinist William Terwilliger and pianist Andrew Cooperstock, presents a centenary celebration of Leonard Bernstein, one of America’s most popular and iconic composers. Highlighting music from their acclaimed recordings, the program will include Sonata for Clarinet and Piano (arranged for vln/pno), Touches: Chorale, Eight Variations and Coda, and Four Moments from Candide. The program also includes Copland’s, Duo for Flute and Piano (arranged for vln/pno), and Sonata for Violin and Piano. Critics have recognized Opus Two for its “divine phrases, impelling rhythm, elastic ensemble, and stunning sounds,” as well as its commitment to expanding the violin-piano duo repertoire. Following their long tradition of championing the works of great American composers, Opus Two recorded works of George Gershwin that reviewers called an “excellent” recording adding that the “performers throw themselves into this fresh look at Gershwin with enthusiasm and enjoyment.” The Gershwin is the newest addition to Opus Two’s growing discography of American music which includes CDs dedicated to works by Paul Schoenfield, Aaron Copland, Lowell Liebermann and their debut recording on the Naxos label, Leonard Bernstein: Violin Sonata; Piano Trio; New Transcriptions. In celebration of Bernstein’s centennial, Cooperstock recently released Leonard Bernstein: Complete Solo Works for Piano which was praised by Arts Fuse, “if there’s an essential Leonard Bernstein at 100 album, this is the one; with excellent performances of relatively unknown music deserving to be heard.” Cooperstock serves as artistic director of the University of Colorado, Boulder’s upcoming Bernstein at 100 Festival. Recent concerts have taken them to Colorado, Florida, Texas and Hawaii. This past summer they returned to Germany’s Saarburg International Music Festival where they were in residence, and performed at Austria’s Classical Music Festival with concerts at St. Stephen’s Cathedral, the Mozart House in Vienna, the Esterhazy Palace and Haydn Conservatory in Eisenstadt where they performed Haydn’s Double Concerto. The duo returned to the Columbia Museum of Art in South Carolina last spring in a much anticipated multi-media performance of their recent commission by composer Meira Warshauer followed by performances in Honolulu and master classes at the University of Hawaii. Opus Two’s recent appearances include performances at the Australian Festival of Chamber Music, Maverick Concerts, Brevard Music Festival, the Round Top International Festival-Institute and Rocky Ridge Music Center.